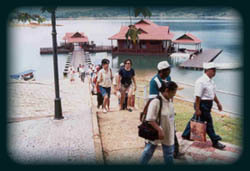 Completed in 1991, the Gawi Jetty serves as the main gateway to Tasik Kenyir. 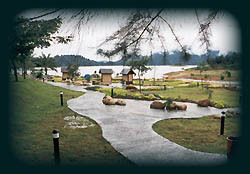 Here, transfers by boat can be made available to the resorts, chalets and lodges located at various parts of the lake. With the current and growing influx of tourists to Tasik Kenyir, plans are afoot for another gateway, the nearby Pengkalan Utama which will be equipped with bigger and better facilities. Gawi is also the nearest access point to Taman Negara. Should you decide to head for the park, please remember to obtain a permit from the Wildlife Department at the Tourist Information Center.